I was thinking about this as well. Some thicker larger habitat modules, maybe some smaller shuttle like cockpits for small planetships, and some zero-g modules to connect the main rotating habitat modules. And if there's zero-G modules, there'll need to be some sort of coupler to ferry people between spinning and non-spinning parts. The way I usually imagine it is a circular maglev track with a small pod on it that acts like an "elevator" - it speeds up to match the rotating section, people get on, and then it brakes and docks at a hatch to the zero-G section. IMO any species that has the time and technology to build fantastic starships like these is likely to have also been able to overcome any deleterious effects that zero-G would have on their bodies - either by medicines or by simply reengineering themselves - and we'd see a lot of zero-G habitat space simply because of how much more flexible and convenient it is to build. Spinning sections might be a special-purpose component (for visitors, for training, for manufacturing, etc) rather than generic living space. I think, that the main problem in zero-G is moving through habitat section. If it is small, you can use walls to walk by hands, but if it is big, it will be very painful to got from one place to another. Probably, we could use something, like magnetic boots to walk on any magnetic surface directly. Probably, we could use something, like magnetic boots to walk on any magnetic surface directly. On short trips that does sound like it would suffice. What about anything longer? Your bones would still need stimulation from gravity. Magnetic boots are one of the few technologies that we could make right now. Side question. How come the technology used in Star Trek for sustaining artificial gravity was never used for propulsion purposes? Manipulation of gravity seems like the main theme for space travel. Seems to me that if you can create positive gravity, then reversing it could be used for hovering, maneuvering? The Star Trek: The Next Generation Technical Manual explains that, the artificial gravity generators have spinning superconducting magnets inside them and even if you cut all power it still takes hours for them to slow down on their own and stop generating gravity. Anyway, I'm convinced that if a civilization has had the time and intelligence to build kilometer-long faster-than-light starships to colonize the cosmos they'll have figured out which genes to tweak in their own biology to keep their bones resistant to the effects of weightlessness. Or how to make medical nanomachines to patch up the damage. And even if they can't for some unknown reason, it still makes sense to have zero-G spaces on a ship in addition to spinning sections. They'll be needed as workspaces for construction, for example. Or even just for fun. The crew of a starship is free to move about their ship without the problems of weightlessness because of a network of small generators working together to provide the proper sense of "down". The gravity field itself is created by a controlled stream of gravitons, using the same principles as the ship's tractor beams. Power is channeled into a hollow cylinder of anicium titanide 454, where a superconducting rotor of thoronium arkenide is suspended in a pressurized chrylon gas. Once set into motion, the rotor generates a graviton field gentle enough to simulate the gravitational pull of a standard Class M planet. Requiring only occasional energy, the rotor can continue to provide an attraction field for up to 4 hours after a power loss. I'm curious what's happen if you go outside the ship under its "bottom" side? Are there will be gravitational repulsion, or those generators creates gravitational attraction in all directions? I have never understood things like ability to fall through the floor into space (like in "Aliens"). I'm curious what's happen if you go outside the ship under its "bottom" side? You experience Zero G below the generators. In this scene from First Contact they go outside the ship and have to use magnetic boots to walk. Outside of the ship the gravity generators do not work. Are there will be gravitational repulsion, or those generators creates gravitational attraction in all directions? The generators in Star Trek are used for inertial dampening, structural integrity, and 1 directional "down" force of gravity. I have never understood things like ability to fall through the floor into space (like in "Aliens"). The basic idea is it creates a single direction gravity well across the ship. If a hole opened up and you fell in you would exit the 1 directional field and your velocity would be preserved so you would continue to "fall". Being science fiction they tend to emphasize on the "fiction" when imagining these technologies. Yes, this is simply impossible. "Force lines" of gravity field can't suddenly end up, they must be closed on some source. This is like creating a magnet with cut force lines. I'll have to agree with Space Engineer. Those gravity pods basically set themselves up as the local gravity well. An object in motion will continue in motion, according to Sir Issac, so given the dripping acid blood, it would commence to orbit the ship after it left the artificial gravity field. Those gravity pods basically set themselves up as the local gravity well. An object in motion will continue in motion, according to Sir Issac, so given the dripping acid blood, it would commence to orbit the ship after it left the artificial gravity field. They don't in Star Trek and other science fiction movies/shows which is what we were talking about. Real world physics don't really play into a fictional universe with fictional technology. In Space Engineers, there are gravity generators, with a field, extending over the ship hull. So if you're under your ship, then you will be pushed away from the ship. You aswell can config the power and the width of the ship. I tought often, if there isn't a way to shield the gravity effect with some electromagnetic fields. At least there is often mentioned something about electrogravity. But i am not an physican and don't know, how and if something like this could even work. 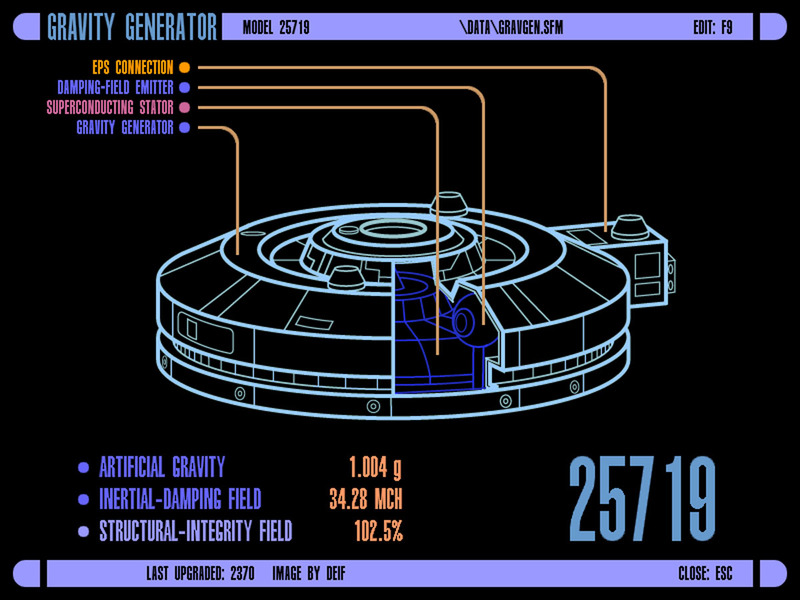 For a gravity generator, yes i would endorse it, but only with a very high advanced technology and a lot of power requiment. Gravity could be a large gameplay element. Normaly, a lifeform will need gravity over long time, because no gravity will weaken the body over time. One of the reason, the astronauts would have to make a lot of sport, muscle training and longer trips are a problem. In Space Engine, this could be a gameplay element, that only motherships are large enough for rotation rings, and if you don't have a ring, you have to visit a planet from time to time to get some gravity. Only question is, how something like this can be balanced. Sitting around for hours, or days on planets, could be a bit disadvantageous for the fun. Later in the game, there could be gravity generators, at least in some areas of the ships. @Vojtypka: The link is on the 1st post.